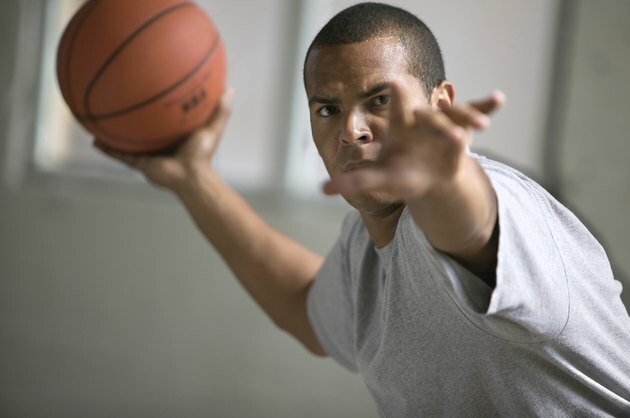 Passing the ball in basketball requires touch, vision, dexterity and strength. Good teams have players who look to pass the ball to the open player to take the ball to the basket or get a good look for a jump shot. You can pass the ball effectively in several ways. A chest pass is the most basic way to move the basketball from one player to another. If you have an open teammate and there's little or no chance that an opponent will steal the ball, the chest pass should work well. Hold the ball with both hands and pushing hard and outward with your thumbs. Aim for the teammate's chest. The bounce pass often is just as accurate as a chest pass and harder to defend. Hold the ball at chest level and bounce it off the floor halfway between yourself and your teammate. The defense may be anticipating a chest pass and often might not be ready for a ball that bounces hard and comes in from a low angle. The baseball pass is a type to use when you have the ball in the back court -- often after a steal -- and your teammate is breaking to the basket. Take the ball and bring it overhead and throw a hard, direct pass to your teammate. The pass should lead your teammate and give him a chance to catch the ball at full speed and then accelerate toward the basket. Defensive rebounders often use the outlet pass. After getting a rebound off the defensive boards, a power forward or the center will take one step away from the basket and throw the ball toward the sideline, where a guard catches it and starts the attack. This pass often is a two-hand overhead pass or as a bounce pass. Hall of Famers Bill Russell, Wilt Chamberlain and Wes Unseld excelled at making this pass. The no-look pass is designed to confuse the defense. A point guard leading a fast break can use this pass with success. It has a high degree of difficulty because the passer looks in a different direction than the direction in which the ball will be going. It is very easy to throw this ball away for a turnover, but when the play works, it usually leads to an uncontested layup or a dunk. Magic Johnson made this pass one of his signature moves during his career, and point guards have been using this move since the 1980s.